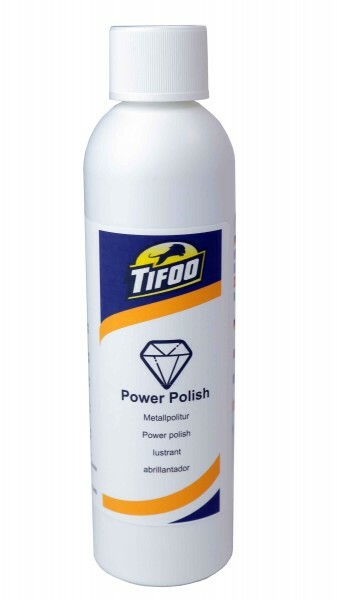 Product information "Polishing agent "Power Polish" (200 ml)"
This top product from Tifoo allows you to polish numerous metals like iron, nickel, lead, tin, silver, gold, copper, zinc, aluminium, chrome, bronze, brass, palladium, rhodium or platinum. In order to achieve a perfect finish after the electroplating process, we also recommend our Tifoo Power Polish for making the workpiece shine. It allows also to get easily rid of blackening or other discolouration. The application is very simple: apply the polish with a soft and dry piece of cloth on the metal in question, polish it and let the polish work in for a moment. After removing eventual residues with alcohol, the shining result can already be seen. A very good combination for gilding almost every metal: copper (acidic), nickel (or palladium or rhodium) and finally gold. We recommend nickel-plating before if youre treating copper, silver and non-ferrous heavy metal because after some days or week, the gold can mix with the shades (diffusion). All of the necessary electrolytes can be purchased in our online shop. We also offer a currentless alternative to nickel plating. Our varied range of galvanic products and electrolyte solutions supports you in hobby and job. Please read also our instruction manuals. 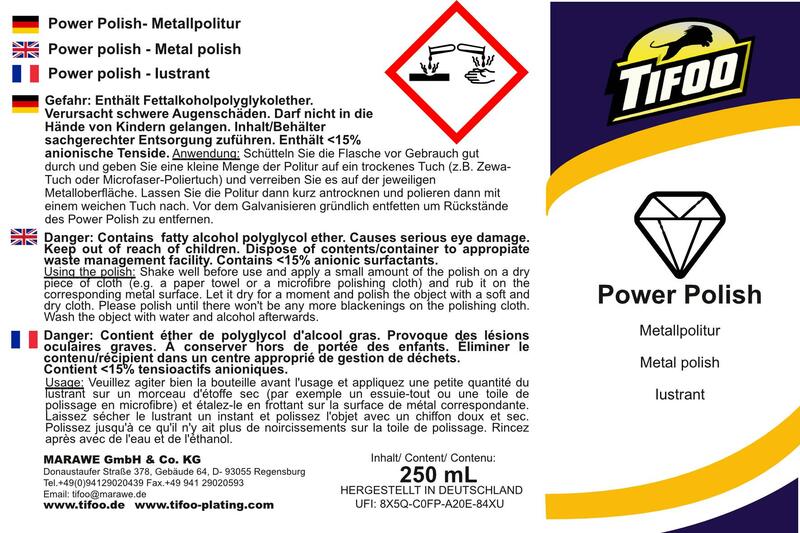 Related links to "Polishing agent "Power Polish" (200 ml)"
Instruction manual for Tifoo Polishing agent "Power Polish" (200 ml) as PDF file. Customer evaluation for "Polishing agent "Power Polish" (200 ml)"